Is Economics an ‘objective’ or ‘positive’ science, independent of ethical and political positions? The financial crisis that began in 2007 gave rise to renewed doubts regarding the ‘objectivity’ of economics and brought into the public arena a debate that was previously confined to academia. 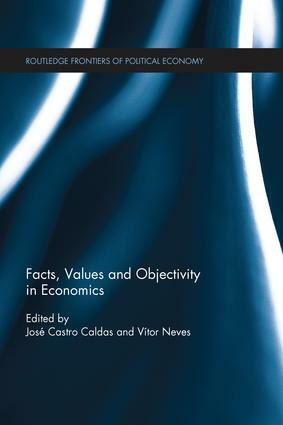 A remarkable feature of the public debate on the value neutrality of economics since then was that it not only involved indictments of ideological biases in economic theory, but also the attribution of the crisis itself to the unethical orientation of economic agents, of economists acting as experts and of ‘economic science’ itself. The contributors to this volume believe that economists of all persuasions are once again compelled to probe the normative foundations of their discipline and give a public account of their doubts and conclusions. José Castro Caldas is a researcher at the Centre for Social Studies, Coimbra University, Portugal (CES). He was previously assistant professor at the Economics Department of ISCTE, Lisbon and researcher at DINÂMIA. Vítor Neves is Assistant Professor at the Faculty of Economics, Coimbra University, Portugal, and Senior Researcher at the Centre for Social Studies (CES). He is also member of the Stirling Centre for Economic Methodology (UK).